Put onions, Italian dressing, butter, pepper, and paprika in a large casserole dish. Bake for 5 minutes, and then stir to distribute butter. Bake 10 more minutes. Add shrimp and stir to coat with sauce. Bake about 10 to 15 minutes, depending on the size of your shrimp, until they turn pink and are pink and done. Serving Suggestion: Cover your table with newspaper. 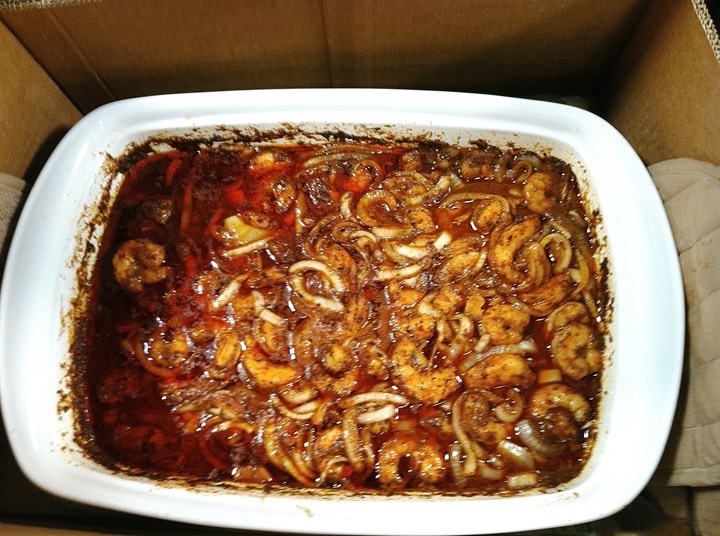 Put the pan of shrimp in the middle of the table on a towel or trivet. Serve with French bread and let your guests or family make a mess throwing peels on paper and using bread to dip in the sauce and onions. For clean up, you throw away paper and wash the pan! How easy is that?